October 20, 1940. It was on this day, seventy years ago, that Bhagavan Baba unveiled the mystery surrounding His birth, life and mission. He declared to the people around, and through them to the entire mankind, that He indeed is the Supreme Consciousness embodied in a diminutive and delightful form. 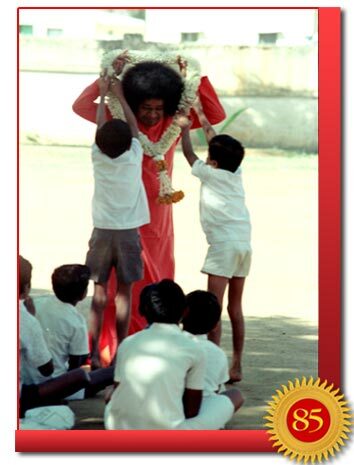 “I am no longer your Sathya, I am Sai…I have My work; My devotees are calling Me…” He announced candidly on that day. Ever since, this eternal reservoir of energy and empathy, hope and happiness, solace and succor, light and love, has nursed and nurtured, and ensured that the tiny seed of goodness latent within every individual grows into a gigantic tree of love and serenity. And like a perfect teacher, He has demonstrated this more by living that principle in every moment of His own life. The result is a luminescent legacy that will continue to illumine the dark alleys of humanity’s collective consciousness, elevating it to a state of absolute sublimity for generations to come. “Loving Legend – Living Legacies” seeks to capture a few salient highlights of this glorious saga of Pure Love. This 30-episode radio documentary starts on October 20, 2010 on Radio Sai to continue daily till November 19, 2010. Below is the textual adaptation of this audio series embellished with pictures, audio and video clips! Let us immerse ourselves in the story of His glory and more important strive to make our little lives shine with the sacred glow of purity, nobility and genuine compassion. This is the promise of Krishna in the Bhagavad Gita. God fills the Universe with His constant presence. But when the time is ripe, when dharma declines, He takes on a form for the benefit of man. Eighty-five years ago, the Divine Incarnated again. 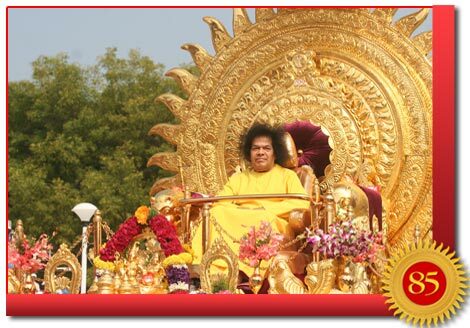 The Supreme Lord - the Lord of the Universe - took form in the tiny and remote village of Puttaparthi. “Strife and discord robbed peace and unity from the family, society, cities, and the state. “Because of this, I have come. “Spiritual aspirants prayed and I have come. “To foster the Vedas and to support My devotees I have come. “Your virtue, self-control, detachment and your faith: these are the signs of My glory. When you place yourself in My hands fully, completely, with no trace of ego, only then can you claim to be My devotee. “The Avatar behaves as a human so that man may feel kinship, but rises to His superhuman heights so that man may aspire to reach the heights, and through that aspiration realise the Divine. “This is the task for which I have come. “Rama and Krishna slew demons, the enemies of the righteous. But who are the righteous today? All are tainted by wickedness. Who will survive if the Avatar decides to uproot? “So that man may give up evil propensities and tread the path of righteousness, I have come. “To counsel, to help, command, condemn and to stand by as a friend and well-wisher to all - this is the reason for which I have come. “If you will accept Me and say "Yes," I too will respond and say, "Yes, yes, yes." If you deny me and say "No," I also echo "No." Come, examine, experience, have faith. 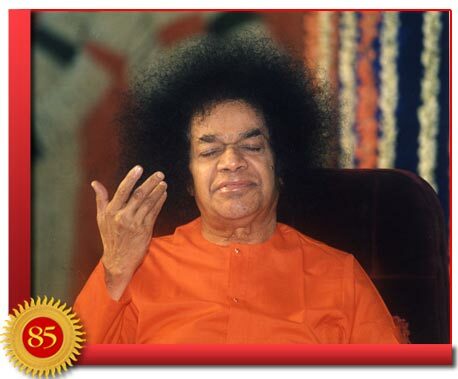 Baba continues: “Maanasa Bhajare… that was the first bhajan I taught the gathering in the garden in Uravakonda. Just moments before I did that, I had returned from high school, threw off my books and declared that My work is waiting for Me. 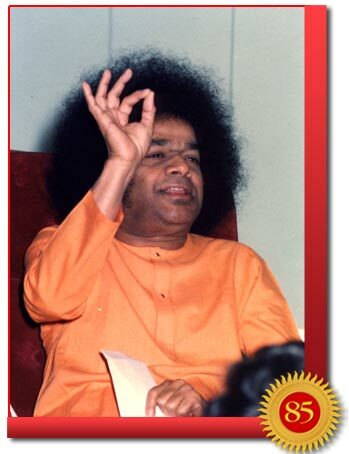 It was then that I publicly announced, ‘I am Sai Baba.’ I called on those suffering the endless rounds of birth and death to worship the Feet of the Guru – the Guru that was announcing Himself - He who had come again to take the burden of those seeking refuge. I do not need your flower garlands. I do not need your fruits. These may be purchased for an anna (rupee) or two. They are not yours. Give Me something that is truly yours, something that is clean and fragrant with the perfume of virtue and innocence, and washed in the tears of repentance. Offer Me the fruits of your actions and the flowers of your inner thoughts and feelings. This is the worship I want, this is true devotion. 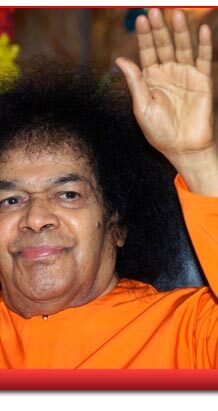 “I do not mention Sai Baba in My discourses, but I bear the Avatar’s name - Sai Baba. I do not appreciate in the least the distinction between the various appearances of God: Sai, Rama, Krishna. I do not proclaim one is more important than the other. Continue the worship of your chosen God along the lines already familiar to you, you will then find you are coming nearer to Me, for all names are mine. All forms belong to Me. There is no need to change your chosen God and adopt a new one when you have seen Me and heard Me. “Every step in the career of the Avatar is predetermined. 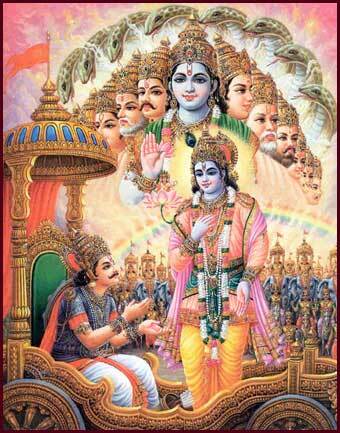 Rama came to feed the roots of truth and righteousness. Krishna came to foster peace and love. Now these four qualities of men are in danger. The righteousness that has fled to the forests has to be brought back to the villages and towns. The strife and discord that are ruining the villages and towns must be driven into the jungle. “If you waste this time, it is your fate. You approach Me for tinsel and trash, petty cures and promotions, worldly joys and comforts. Very few of you desire to get from Me that which I have come to give, namely liberation. “Your intelligence cannot fathom the ways of God. Your intellect is insufficient however clever you are. You may benefit from God, but you cannot explain Him. Your explanations are guesses, attempts to cloak your ignorance in pompous expressions. Bring into daily practice evidence of your knowing Me, of being aware of the secret of the blessed life. Show greater brotherliness. Speak with sweetness and self-control. Bear both defeat and victory with calm resignation. “To demonstrate this blessed life, I have come. “I am aware of the future, and of the past; I am aware of the present of every one of you. So I am not so moved by mercy. Since I know the past, the background, the reaction is different. Your suffering is the consequence of evil deliberately done by you in previous births. So I allow your sorrow to continue, modified perhaps by some little compensation. I do not cause either joy or grief. You have designed these chains that bind you. I am the embodiment of bliss. Come, take bliss from Me, dwell on that bliss, and be full of bliss. “To fill you with bliss, I have come. “My acts are the foundations on which I build My work. The miraculous acts you observe are to be interpreted so. The foundation for a dam requires a variety of materials. Without these it will not last and hold back the waters. The establishment of dharma: that is my goal. The teaching of dharma: that is my method. “These miracles are just a means towards that end. You must have heard people say that mine is all magic. But the manifestation of divine power is not magic. Magicians play tricks for earning their maintenance, gaining worldly fame, and wealth. They are based on falsehood, and they thrive on deceit. This body could never stoop to such practices. This body has come through Divine resolve. Divine resolve is always true resolve. There is nothing that Divine Power cannot accomplish. It can transmute earth into sky and sky into earth. If you doubt this, you are too weak to grasp great things, the grandeur of the universal. “Many of you come to Me with problems of health and mental worry. These problems are baits by which you have been brought to Me. The purpose is to give you My grace and strengthen your faith in the Divine. Problems and worries are to be welcomed. They teach you the lessons of humility and reverence. Your running after external things produces your discontent. That type of desire has no end. Once you become a slave to the senses, you will be bound till death. I call you to Me and even grant worldly boons so that you may turn God-ward. No Avatar has behaved like this before, going among the masses, counseling them, guiding them, consoling them, uplifting them, and directing them along the path of truth, righteousness, peace and love - Sathya, Dharma, Santhi, and Prema. “My activities and movements will not be altered. I am unaffected by the judgment of others. My plans are for the establishment of righteousness, to inculcate faith in the path of Prasanthi, the path of highest spiritual peace. “I shall not stop or retract a step, for I am engaged in the task for which I have come. “Cultivate nearness with Me in the heart and it will be rewarded. Then you too will acquire a fraction of that supreme love. This is a great chance. Many hesitate to believe that things will improve, that life will be happy for all and full of joy, and that the golden age will recur. Let me assure you that this divine body will succeed in averting the crisis that has come upon humanity. “This is the grand task for which I have come, and I have not come in vain. “God is inscrutable. He cannot be realized in the outer world. He is in the heart of every being. Gemstones are found deep underground. They do not float in mid air. Seek God in the depths of your self, not in tantalising, kaleidoscopic nature. The body is granted to you for this high purpose, but you are misusing it. Man extols God as omnipresent, omniscient, and omnipotent, but he ignores His Presence in himself. “Who can affirm that God is this or thus? Who can affirm that God is not of this form or with this attribute? Each one can acquire from the vast expanse of the ocean only as much as can be contained in the vessel he carries to its shore. From that quantity, he may grasp little of that immensity. “Each religion defines God within the limits it chooses and claims to have grasped Him. Like the seven blind men who spoke of the elephant as a pillar, a fan, a rope or a wall, because they contacted but a part and could not comprehend the whole, so too, the various religions speak of a part and assert that their vision is full and total. “Each religion forgets that God is all forms and all names, attributes and assertions. There is only one religion and that is the religion of Love. The various limbs of the elephant that seemed separate and distinct to the eyeless seekers of its truth were all fostered and activated by one single stream of blood. The various religions and faiths that claim to be separate and distinct are all fostered by a single stream of love. “My power is immeasurable. My truth is inexplicable, incomprehensible. I am announcing this about Me, for the need has arisen. Let Me tell you that emphatic declarations of the truth by Avatars were made so clearly and so unmistakably only by Krishna in the past. In spite of this pronouncement, you will notice that Krishna underwent occasional defeat in His efforts and endeavors. Those defeats too were part of the drama that He Himself directed. When many kings pleaded with Him to avert the war with the Kauravas, He confessed that His mission to the Kaurava Court for ensuring peace had failed. But, he had not willed that it should succeed. He had decided that war would be waged. His mission was to reveal the greed and iniquity of the Kauravas and to condemn them before the world and for all time. “Now, I will tell you that, during this Sai Avatar, there is no place for such drama with scenes of failures and defeats. What I will, must take place; what I plan must succeed. I am Truth. Truth has no need to hesitate, or fear, or bend. “Sai has come to unite mankind as one family in the bond of brotherhood. Sai has come to illumine the Atmic reality of each being, the Divine basis on which the entire cosmos rests. Sai has come to reveal the divine heritage that binds man to man, so that man may rid himself of his animal nature, and rise to his goal, which is the Divine. For the past 84 years, Bhagavan’s magnetism has drawn millions from every nook and corner of the globe to His abode of peace, situated in the village of His birth. 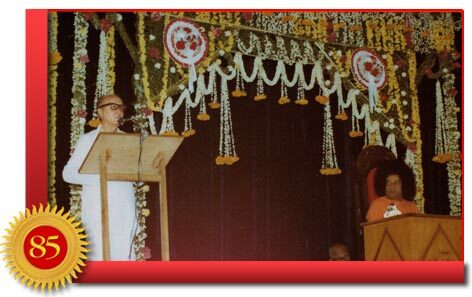 Prashanti Nilayam has emerged as the undisputed spiritual capital of our times. 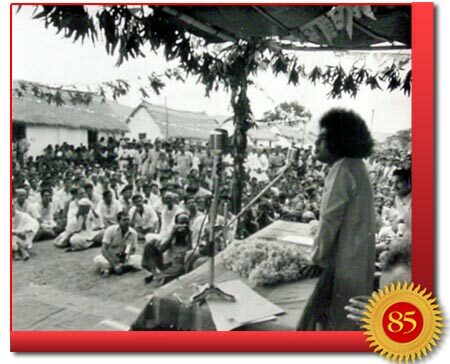 At the heart of this unparalleled spiritual activism is the soon-to-be 85-year-old Divine Magnet of Love who has single-handedly reformed and revitalised the system of education, steering it towards a value based model, redefined universal healthcare and harmonised spirituality with social service. That His teachings transcend all boundaries of race, religion or region is what appeals the most to His followers. His formula for leading a meaningful life is the five-fold path of truth, righteousness, peace, love and non-violence. Love for God, fear of wrongdoing and morality in society are His prescriptions for healing our world. With millions of followers, Baba’s example as a universal teacher and humanitarian has inspired thousands of voluntary initiatives by the members of the Sai Organisation worldwide. 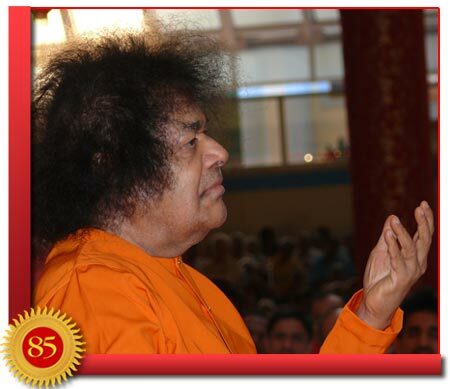 The Sri Sathya Sai Seva Organization is active in 23 Indian states and 185 different countries and serves across all religious, national or ethnic divide. His boundless love, international reach and unprecedented achievements are so potent that men and women of the highest academic calibre and from diverse ethnic backgrounds look up to Him as their guide, as do the poorest and the unlettered. 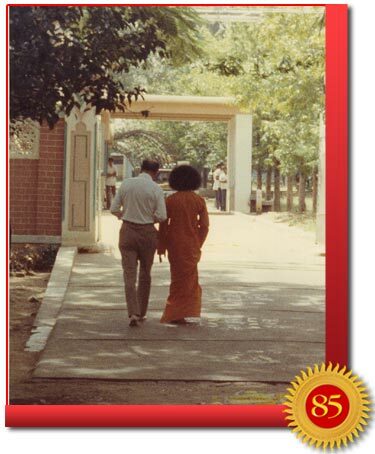 Our loving Master, Bhagavan will soon enter into the 85th year of His divine mission. We owe it to our Beloved Lord for all the love, patience and faith that He has continually inspired in us to heed His clarion call. What is our duty as His devotees? In a message to Charles Penn, our Beloved Baba gives us a mission statement to live by. “Your mission has begun. Those are My words to you, My devotees. Each of you has a unique and valuable part to play in this lifetime. Only those whom I have called can serve Me. “My Mission has now reached that point in time when each of you now has work to do. This planet has a purpose in the great galaxy in which it is held. That purpose is now unfolding before our eyes. I call upon you to radiate the Bhakti within you so that its unseen power will envelop all who come into your orbit. To successfully perform your part, always remain centered upon Me. “Allow yourself to impart that purity of heart within you towards all human beings and all living creatures and do not reach for the fruits of your work. “This part of My Mission is performed in absolute silence. You are My instruments from whom My love will pour. Be always aware that the moment you let your ego descend upon you, My work ceases. When you have overcome your negative mindedness, you will again become My Source. “The multiplication of My Love will be felt throughout the world. I have prepared you for this work over many incarnations. I have drawn you to Me. I have made great steps in My Mission over these past incarnations. My work is ceaseless and so your work, too, is without end. “Know that I am within and without you. There is no difference. Rid yourselves of the petty matters forevermore. You are now in Me and I am now in Thee. There is no difference. My darshan will pour forth from Me to and through you. You may be unaware of this constant action. Be ever pure of heart and soul, and mankind in your lifetime will benefit from your unique qualities. “Others, too, will join Me in this Mission when I draw them to Me. The time is approaching when all humanity will live in harmony. That time will be here sooner than one expects. Before it arrives be prepared for whatever is needed to reveal to every living thing the true purpose of existence. It is not what anyone alive can imagine. It is not something that one can try to aspire to. It is beyond all comprehension. I can say that its beauty is magnificent beyond all dreams. And as each of you perform your silent work, I embrace you to My Heart and henceforth your souls shall be lifted up and your eyes will reveal My Presence within. “This I say to all My Devotees from the Lord's Mountain Top where all the Universes become one. Be about My work, My beloved Bhaktas. Your breath will carry the scent of the blossoms of Heaven. Your example will be that of Angels. Your joy will be My Joy. With this powerful and penetrating message we bring this lovely series on our beloved Lord to a close. 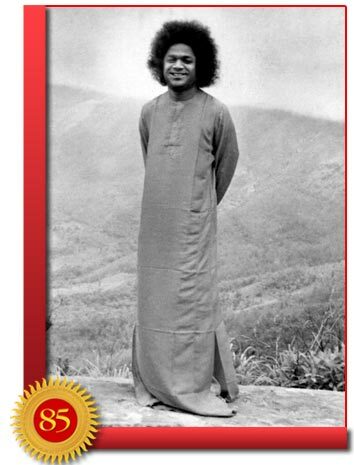 Let us always remember that only when we learn love all as sincerely and genuinely as He does and shine, with the brilliance and purity of our Atma seeing Him in all and serving Him in everyone can we call ourselves His devotees. Let us ruminate and reflect on this and rededicate our lives at His Lotus Feet on this glorious occasion. What are your impressions about this article? Please share your feedback by writing to [email protected] Do not forget to mention your name and country.